Old school locals pub but nice friendly to locals. Only been there half a dozen times when passing through the area, but never had a bad pint in there, most recently drank Brockley Pale Ale, 4.1% at £3.29 a pint which was lovely.. Nearby to Ladywell station and as it's on the road from Lewisham to Catford loads of busses pass by. Was at this pub just last night. Night was billed as a low key'Folk night'. Number of musically minded people turned up armed with a myriad of instruments to improvise various songs. Public could also join in to jolly sing-a-longs! At the back of the pub, number of people playing card games. Seemed like a pub from a bygone age! Atmosphere of pub enhanced with good quality, fresh ale. Both Spitfire and doom Bar in immaculate condition. Shall return again! 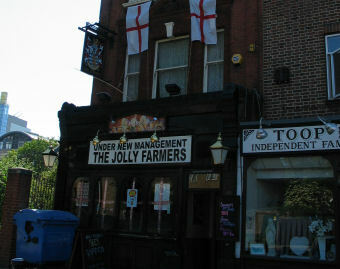 I've been coming to this pub for many years, through its various changes in managers and even names. Overall, it's a good place for people who prefer pubs to be places you can talk in, and where the staff know who you are after just a couple of visits. Having said that, it struggles a bit, in the British way, with the fact it's brewery-owned, which means the management are never really going to benefit greatly, at least not directly, from any improvements they make. The main bug-bear I have with it is its recent tendency to have the radio playing constantly (often at the same time as the TV). They used to play CDs, which is fine but, presumably because that means regular trips downstairs to change them, the staff now prefer to leave the radio on. Worse still, it's always some crap commercial station where you're forced to listen to half-wit DJs babbling on about, well, themselves mostly. Lovely pub, always good real ales on tap, nice staff, and a very very good quiz night on a Wednesday. 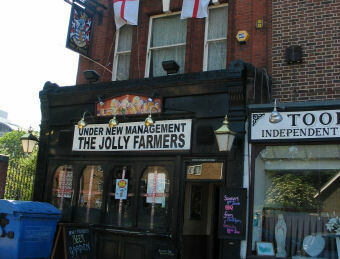 Try it, its certainly one of the nicest pubs in Lewisham. Friendly local pub, just outside Lewisham town centre with a few characters. The beer range was relatively ordinary - Ringwood Best, Jennings Cumberland Ale, Shepherd Neame Spitfire & Sharps Doom Bar, with one spare handpull. Both the radio and TV were on. Live music is advertised for a Sunday evening, and as I sat there, the evening's entertainment arrived to set up on the aforementioned stage. Quiz nights are apparently on Wednesdays. There's a kind of Irish bar feel to this place, and I believe I overheard a few Irish accents. Bare floorboards and some attractive screens complete with stained glass provide a fairly pleasant drinking environment (despite the noise and the presence of a fruit machine).